Cow and Calf Rocks01943 602319work Viewpoint/Beauty SpotHigh on Ilkley Moor the Cow and Calf Rocks are a large rock formation consisting of an outcrop and boulder, also known as Hangingstone Rocks. The rocks are made of millstone grit, a variety of sandstone, and are so named because one is large, with the smaller one sitting close to it, like a cow and calf. According to local legend, the Calf was split from the Cow when the giant Rombald was fleeing an enemy, and stamped on the rock as he leapt across the valley. The enemy, it is rumoured, was his angry wife. She dropped the stones held in her skirt to form the local rock formation The Skirtful of Stones. 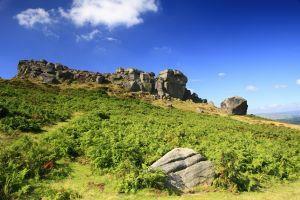 The rocks are a great place to climb and the moor offers spectacular views of Ilkley and beyond. High on Ilkley Moor the Cow and Calf Rocks are a large rock formation consisting of an outcrop and boulder, also known as Hangingstone Rocks. The rocks are made of millstone grit, a variety of sandstone, and are so named because one is large, with the smaller one sitting close to it, like a cow and calf.